People are over-cooking their eggs! 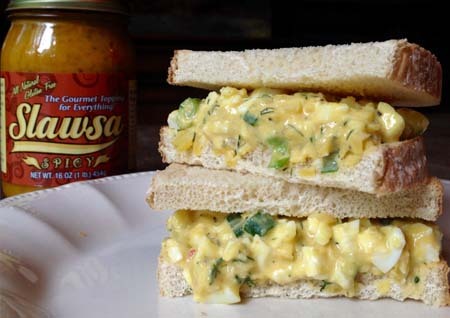 When you overcook the yolk, you have to add more mayo to reduce the dryness, thus drowning out the egg flavor and overall stiffness that makes a great egg salad. In a great egg salad, you really don’t need a ton of mayo. Also, the yolks remain bright and adds to the overall color of the egg salad. Place large eggs in pot of cold water (just covering the top of the eggs by 1/2 inch). Bring water to a boil. As soon as it starts to boil, remove from heat and cover for 9 minutes. Immediately remove from hot water and put into ice water to stop the cooking process. Peel while the egg is wet (meaning, don’t remove it, let it dry, then peel). Peels easier when wet. PS. Use “older” eggs as they’ll be easier to peel. You can also put a little baking soda in the cooking water as well for more peel-able eggs. Coarse chop the eggs and place in a mixing bowl. You do not need to separate the yolks and pre-mash them up because they’ll fall apart in the mixing process. DO NOT chop your eggs too fine. Add in the Slawsa, green onions, lemon, salt and pepper and mix thoroughly. The mayo and dill are the last two things to mix in as you want to add the mayo a little bit at a time until the desired constancy is reached. You may not need 1/8 cup. Also, depending on your preference of the dill flavor, you may want to add half in and taste it before adding to your desired taste. Refrigerate to firm up before eating. Makes 2 egg salad sandwiches. Rule of thumb: 2 eggs will make one sandwich/serving so that’s how you determine how much to make. To make the Slawesome Egg Salad, mash eggs with a potato masher in a large bowl. Add in the Celery, Slawsa, Mayonnaise, Kosher Salt, Black Pepper and Dill, and incorporate well. Refrigerate until use. To make the "carrot cones" take aluminum foil and completely cover ice cream cones smoothly. This will act as your mold. 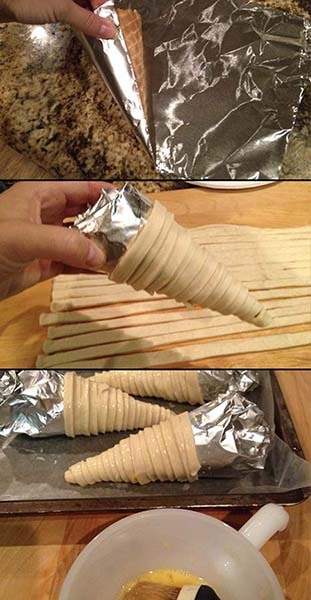 Starting at the bottom of the aluminum cones, wrap the dough going all the way up the cone to the desired size. Make an egg wash and lightly brush the outside of the crescent cones with it. Place on wax paper on a cookie sheet and refrigerate for 20 minutes. Then bake for 9-11 minutes at 400 degrees. Allow to cool 2-3 minutes and remove the aluminum cone by twisting and pulling it out. 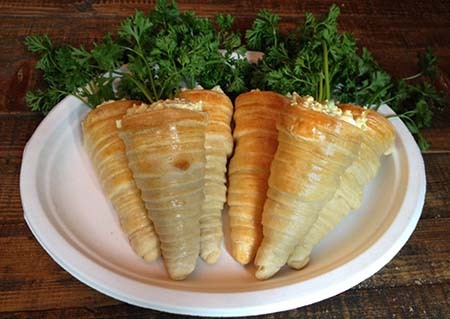 Allow the carrot cones to cool completely before filling with egg salad. Garnish with parsley sprigs. Combine all ingredients except mayo and incorporate well in mixer. Add mayo until desired consistency is reached. 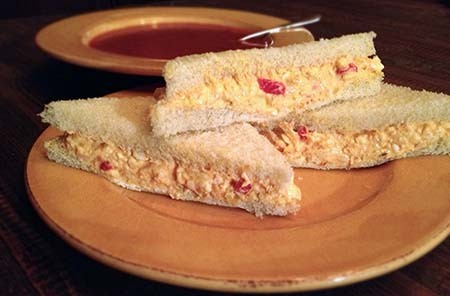 Whether you're spreading it on crackers or making pimento cheese sandwiches (which can be eaten cold within a crustless white bread or as grilled cheese style with some fried pancetta within as a bonus), this is one Slawesome Recipe you must try! Set Broiler to 500°. Combine all ingredients except Crab Meat in a bowl and mix well. Fold in Crab Meat. 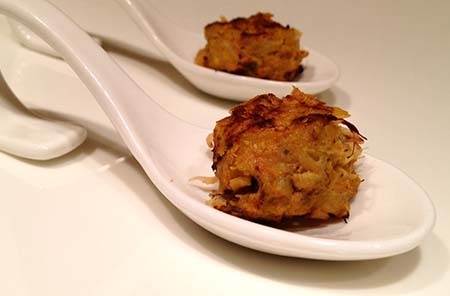 Make crab balls by forming into quarter-size balls and place on broiler pan. Put under broiler for 3-4 minutes, then flip. Broil for 3-4 minutes longer until finished. Because they are so moist because of the Slawsa, additional aioli or sauce is not necessary. Thoroughly mix together yokes, Slawsa & mayo. Pipe into egg whites. For additional depth, add 6 slices of cooked and crumbled bacon and 2 Tbsp finely minced red onion to the yolk mixture. Garnish with paprika and a sprig of parsley. For perfectly cooked and easily peel-able hard-boiled eggs, put 12 eggs in saucepan, covered 1 inch over eggs with water. Add 2 tsp. of Baking Soda to water. Turn heat to high and bring eggs to a boil for 1 minute, then cover, remove from heat and let sit for 12 minutes. Remove eggs and place in ice bath to cool quickly before using. Combine the Pork, Garlic Powder and Ginger Paste and mix thoroughly. Cook pork mixture in a skillet until cooked through and drain. Add to the pork mixture, the Slawsa, Carrot and green onions. In a separate small bowl, combine flour with 1 Tbsp. of Water and mix thoroughly into a paste. Heat oil in skillet to medium. 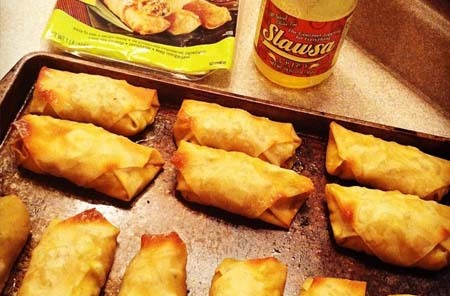 To assemble the egg rolls, take the wrapper and lay out like a diamond. Place the sausage filling in the middle, roll up the bottom, then sides and roll into the top corner. You should use some of the flour paste to help "glue" the final corner. Place in skillet, seam side down initially and turn when browned. Egg Rolls only take a minute to cook and they can also be baked per the instructions on the back of the egg roll wrapper package. Goes great with Slawesome Sweet & Sour Sauce. Heat oven to 400 degrees. Grease a cookie sheet with oil. 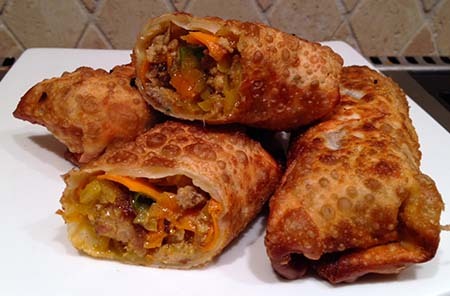 Grease one side of an egg roll wrap with oil, then lay that side down, and layer one tbsp. carrots, 2 tbsp Slawsa & 1 tbsp hemp tofu in the middle of the wrap. Fold the egg roll by the directions shown above, and place on the greased cookie sheet. Repeat the last two steps until all the wraps are filled. Bake for 15-20 minutes, or until golden brown. Remove from oven and allow to cool about 5 minutes before serving. Preheat oven to 375 degrees. Butter a mini-muffin pan and place each square of the crescent dough in each muffin hole, do not press in too hard but push the dough in slightly. Thoroughly mix together ham, Swiss, Slawsa, red onion, egg and pepper. 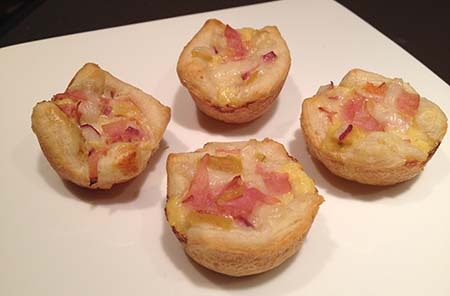 Place an even amount of the ham/Slawsa mixture in each dough cup. Place on center oven rack and bake for approximately 12 minutes. Serve warm. 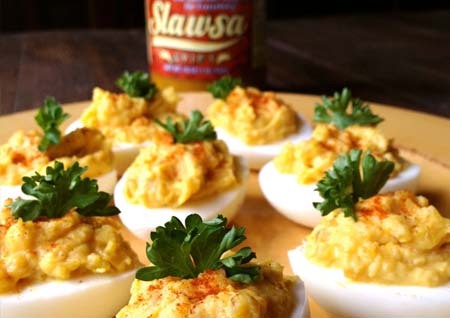 You can test adding more Slawsa Original or Slawsa Spicy to give it more of a zip. In a large bowl, place the avocado pulp and lime juice immediately and toss to coat. Mash the avocados with the juice, salt and cumin. Fold in all other ingredients and serve. Slawsa is the ingredient that will be noticed but your guests won't be able to guess exactly what that "special ingredient" is. An additional sprinkle of cayenne pepper may be added for those who want to add more heat. 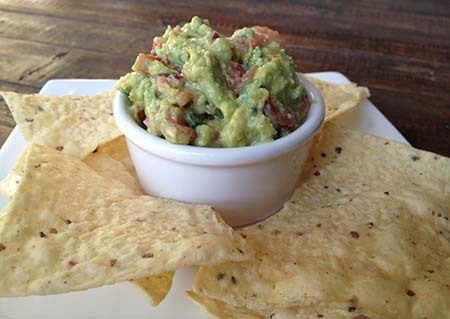 Finally, on the rare occasion there are leftovers, be sure to put your guacamole in the smallest container possible and then cover tightly with plastic wrap directly atop the guacamole so that "air" does not oxidize the dip that will result in brown guacamole. The acid of the lime should prevent this for the most part. Pre-heat oven to 400 degrees. To prepare poppers, mix together equal parts cream cheese and Slawsa and set aside. Cut Jalapeno's lengthwise with stem intact. Remove membranes and seeds. 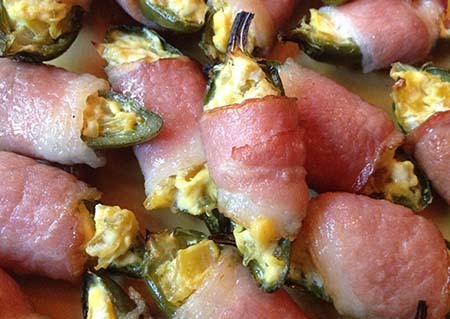 Fill Jalapeño cavities with Slawsa/Cream Cheese mixture and do not overfill too much. Take bacon and cut into thirds, width-wise. If bacon is excessively fatty, feel free to remove fatty parts so you're left with 21 small strips of meat, about 3-4" long. Wrap bacon, not too tight, around each popper. Place on a raised wire rack inside a baking pan (so the excess fat drips through). Bake for about 20 minutes.